Ask fellow campers about "Desert Pueblo RV Park" and nearby attractions. We stopped for a overnight. Park is easy access and sites are level. Staff very helpful with check in and getting to site. We camped at Desert Pueblo RV Park in a Motorhome. 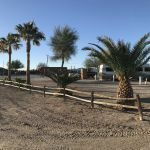 Are you affiliated with Desert Pueblo RV Park ?